This Conference is a great opportunity to take forward our thinking and campaigning around social care following the commitment made at the KONP AGM in June. Members from KONP, HCT, the Socialist Health Association, National Pensioners Convention and Green Party have come together under HCT’s banner to organise what we hope will be an exciting and challenging day. The morning will be kicked off by John Lister and a speaker from the Labour Party then there will be a range of contributions from campaign groups and trade unions fighting for better care, dignity, the ethical care charter, proper wages, conditions and training for care staff, support for carers etc. The afternoon will focus on what we can and should do, with inspiration from Peter Beresford, Emeritus Professor of Social Policy at Brunel University, Simon Duffy, Founder & Director of the Centre for Welfare Reform and Dave Watson, Unison Head of Policy and Public Affairs in Scotland. 11.00-12.00 OPENING SESSION : SOCIAL CARE OR SOCIAL NEGLECT? How can we start bringing services back into public control? How can we win the argument for services to be free at the point of use? How can we get users’ voices to the heart of service design and delivery? How can we get carers’ voices to the heart of service design and delivery? 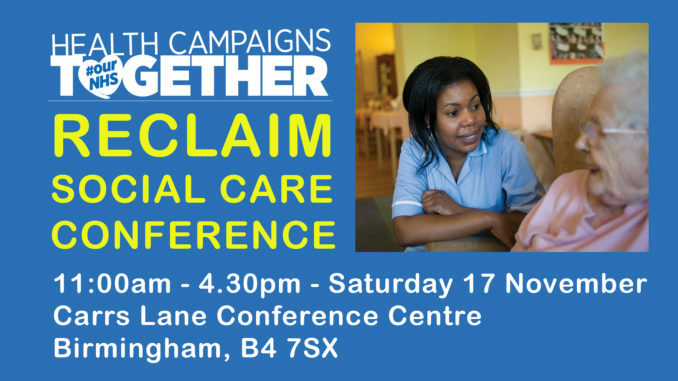 Please bring your experience, ideas and enthusiasm to Birmingham on 17th November and post the flier as widely as possible. If you can raise any financial contributions from your trade union branch or other organisation to help cover the cost of the Conference that would be brilliant. Health Campaigns Together, c/o 102 Corve Street, Ludlow SY8 1EB .